We compare the ex ante observable risk characteristics, the default performance, and the pricing of securitized mortgage loans to mortgage loans retained by the original lender. In our sample of loans originated between 2000 and 2007, we find that privately securitized fixed and adjustable-rate mortgages were riskier ex ante than lender-retained loans or loans securitized through the government sponsored agencies. We do not find any evidence of differential loan performance for privately securitized fixed-rate mortgages. We find evidence that privately securitized adjustable-rate mortgages performed worse than retained mortgages, although other observable factors appear to be more economically important determinants of mortgage default. We do not find any evidence of a compensating premium in the loan rates for privately securitized adjustable-rate mortgages. Both authors are from the Federal Reserve Bank of San Francisco. The views expressed are those of the authors and not necessarily those of the Federal Reserve System. 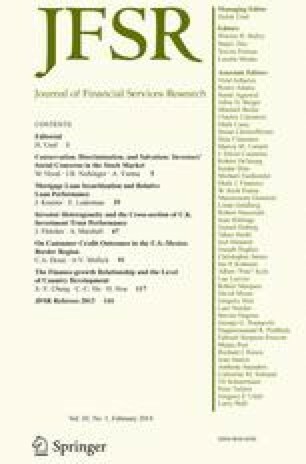 We thank Larry Cordell, Diana Hancock, Christopher James, Michael Koetter, Michael LaCour-Little, Shane Sherlund, and seminar participants at the Research Subcommittee of the Basel Committee on Banking Supervision, the Federal Reserve Bank of Atlanta, and the International AREUEA meetings. We would like to thank James Gillan and Armando Franco for excellent research assistance. 80 % LTV at orig. Past 2yr House price apprec. Standard errors clustered by MSA.